I've been meaning to return to my continuing narrative on the geology of the Colorado Plateau; I didn't want to strand you all in the early Jurassic, as pretty as the rocks of that time are. The next layers on the plateau are a highly variable series of formations from the middle Jurassic gathered together as the San Rafael Group. A lot of geologic action was taking place throughout the region at the time, with the occasional incursion of shallow seas to the region, continuing desert conditions, rivers and floodplains, and maybe even a local asteroid impact. 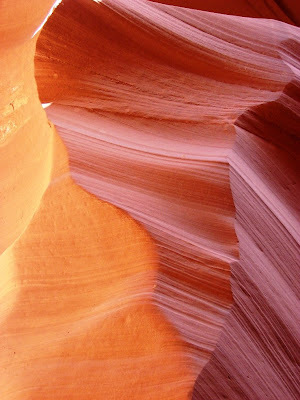 Some of them are formidable scenery-makers, especially the Entrada Sandstone, the subject of the next few posts. Today's photo is an early morning shot from the campground at Goblin Valley State Park in south-central Utah, showing a unique outcrop pattern of the Entrada. It's a teaser, though. More later! This month's Accretionary Wedge is hosted by Goodschist, and includes a great topic, "Geologeeeeee in Spaaaaaaaace!" I have noticed that some of my favorite topics on planetary science have already been mentioned by those with far greater expertise than my own, and I look forward to reading them all in a few days. What I am doing instead is to publicly struggle with a teaching concept I have been thinking about for a few days. It has to do with our perception of the cosmos. I spent the weekend in the Owens Valley of eastern California, and slept under the stars (I REALLY hate tents). Staring into the darkness, I could see the Milky Way stretching across the sky, thousands of individual stars, and Jupiter shining in the west. Intellectually, I know that shooting stars, planes, and satellites are phenomena of our own planet, that the planets are part of our Solar System, that there are stars in our local corner of the cosmos, and that the Milky Way is a vast distant arm of our galaxy. The Andromeda galaxy lies far beyond. But looking at the sky, I could only see a dome, painted with little dots of light which for all I could tell were equidistant from me. The ancients thought of the cosmos this way, and they made stories to go with the random arrangements of stars that formed bears and hunters and scorpions. Even though we know we are not looking at a dome, we still take our kids to planetariums, and above their heads is ... a dome. Stars are projected onto the surface of that dome, and lots of wonderful education ensues. But kids come away thinking of the heavens as a dome. They go to summer camp, and they learn astronomy by identifying constellations, just like their ancient ancestors. And the sky remains to them as a dome. There is no true sense of vastness of the space they are seeing. So it is that I stand in the darkness, and try to wrap my mind around the literal infinity that lies above me, and it occurs to me to try things a bit differently. If you can get to a dark place give this a try. If you have a full view of the sky, you need to lie down and change the perspective a little. 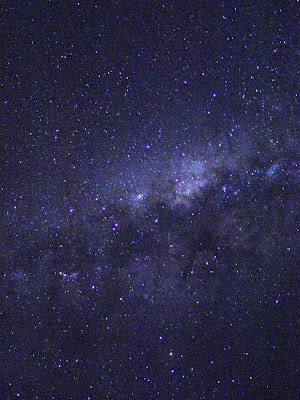 If you have a view of the Milky Way, orient yourself so that it extends across your view, from left to right. Now, instead of thinking of the scene as being above you, in your mind make it in front of you. You are at the front window of a vast spacecraft flying level with the plane of the galaxy, and all the stars below the galaxy are also below you, at your feet. Only the stars above the plane are actually above you. For me, anyway, this perspective gives a three-dimensional aspect to the cosmos, and the dome disappears from view. Doesn't work for you? Well, try something else... lay on a flat rock or a cot with a full view of the sky, and look at it with your head oriented upside down. Suddenly, you will find yourself clinging to the bottom of the planet, looking at the entire cosmos below you. I know this particular post doesn't exactly follow this month's Accretionary Wedge; I am absolutely fascinated by new findings of liquid erosion on Titan, of ice-covered seas on Enceladus, of volcanoes on Io, and incredible explorations of the surface of Mars, and all the incredible photographs coming from the Cassini spacecraft at Saturn. But I wonder that despite the technology of giant telescopes and interplanetary spacecraft, we still stand on the ground and see the sky the same way our ancestors did millenia ago. This is a delightful and direct connection with our past, but a real disconnect between what we knew then and what we know now. Let's finally be done with domes! Today's photo was taken on the flank of Mauna Kea in Hawaii on a perfect night. We are back from our journey to the east side of the Sierra Nevada, mostly in one piece, mostly not sore, and quite not thrilled to be back in a stuffy classroom! We spent four days touring the length of the Owens Valley, Mono Lake basin, the White Mountains, and the barren hills around the ghost town of Bodie. The Sierra Nevada is a discrete block of continental crust that is considered to be sort of a micro-plate that is moving northwestward, stretching and breaking the crust in its wake, causing the formation of the deep fault valleys of the Basin and Range province. 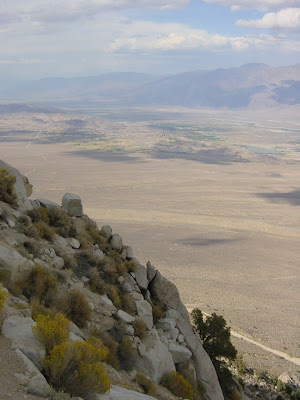 Owens Valley is one of the deepest of these, with a floor at 4,000 feet, and mountains on either side reaching 14,000 feet (a valley nearly twice as deep as the Grand Canyon, but not carved in any way by rivers). The Sierras include numerous granitic intrusions interspersed with roof pendants of older metamorphic rocks. 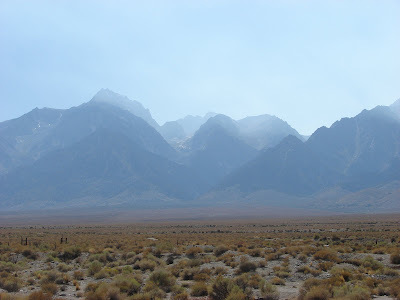 The lesser-known White Mountains on the east side of Owens Valley are composed of some granite, but mostly of late Proterozoic and early Paleozoic sedimentary and metasedimentary rocks (the Cambrian sediments alone are around 3 miles thick). Growing up, I thought the eastern face of the Sierra Nevada would be a great stand-in for the Mountains of Mordor in the Lord of the Rings by J.R.R. Tolkien. The rocks make a nearly impassable barrier for something like 100 miles with only an occasional pass at less than 10,000 feet. To say the mountains are scenic is a gross understatement...the first of today's photos is the range crest in the vicinity of Mt. Williamson near the village of Independence. Farther north, the mountain front is only slightly less rugged, but other factors make for a fascinating geology field trip. 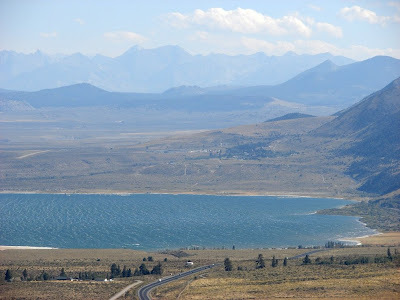 In the center photo one can see the inland sea of Mono Lake in the foreground, some of the plug domes of the Mono Craters in the middle distance, and the high peaks just east of Mammoth Lakes on the skyline (the view is from the viewpoint near Conway Summit on Highway 395). Mono Lake is an ice-age relic that has no outlet (a pluvial lake), so water leaves the region only by evaporating. There are no fish (it is three times saltier than sea water), but there are plenty of brine flies and their larva, and there are trillions of brine shrimp. This is a tasty mix for the millions of birds that use the lake as a stop-over on their seasonal migrations. The lake lost much of its volume when Los Angeles diverted many of the streams that fed the lake in 1942. Recent litigation has led to an agreement to bring the level of the lake to something approximating its original depth (not really, but at least enough to keep the shrimp and flies alive). Parts of the shoreline are decorated by the eerie looking tufa towers that form where fresh water springs flow into the brine. The Mono Craters have very few actual craters. They are instead a curving line of rhyolite plug domes that began erupting around 35,000 years ago, and it is a safe bet to say they are not done yet; the last episodes of volcanic activity were only 600 years ago, at Panum Crater and Inyo Craters. The last photo shows one of the oldest living things in existence: a bristlecone pine. Some of these trees have survived for 4,500 years in the harsh environment at 10,000 feet on the flanks of the White Mountains. The tree in the picture is not dead; a thin line of bark and a few needle-covered branches show that it still lives. It is one of the old ones, though. The fierce winter winds have abraded and polished the resin-rich wood where the bark is gone. Even the dead trees persist; a dendrochronology of the living and dead trees reaches back at least 7,000-8,000 years, giving us an accurate record of droughts and climate change over the time period. 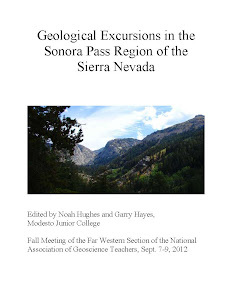 Off to the Sierra Nevada and Owens Valley with my students! No posts for a few days. Don't know whether to wish for earthquakes or volcanic eruptions, or to hope that they don't happen out there....best wishes to the geoblogosphere! Took a brief foray into the Franciscan Complex and Salinian Block this last week...normal people call the region Big Sur, and there can hardly be a more spectacular coastal stretch anywhere (I know there is a lot of competition, though; I'd love to see your favorite photos). 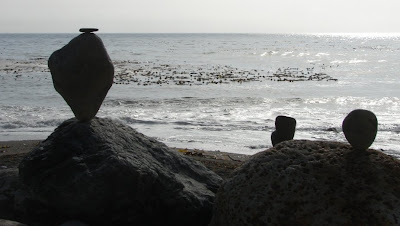 I came across a delicate bit of coastal rock art I thought I'd share. I thought of providing a bit of artistic critiquing, but mostly I simply enjoyed the fragile balancing act, and I pass it on to you. The larger balanced boulder is a chunk of Salinian granite sitting on a much larger boulder of Franciscan chert. The small disk-shaped topper may be a little chunk of graywacke. I appreciated the artist's juxtaposition of the major elements of the local geological relationships. 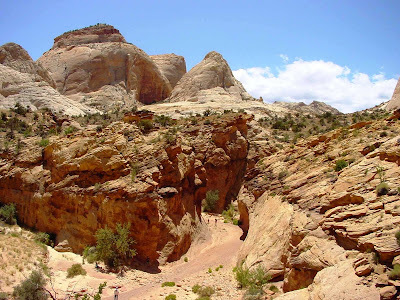 Capitol Reef National Park was mentioned in an earlier post discussing the Wingate Sandstone, but the Navajo Sandstone is also a major contributor to the scenery of the region. The Capitol Dome is an eroded outcrop of Navajo that looks, well, kinda like the capitol dome. These distinctive knobby peaks are a characteristic erosional pattern of the Navajo Sandstone, and can be appreciated during a stroll through Capitol Gorge. Prior to the construction of the present-day paved highway 24 along the Fremont River (in the 1960's), the only way through the "Reef" was the dirt and gravel road through the narrows of the Capitol Gorge. Like the Virgin Narrows at Zion, canyons carved only in Navajo tend to be deep and narrow. 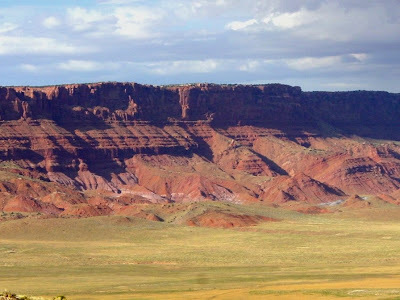 When the river erodes to the level of the underlying Kayenta Formation, the easily eroded shale layers cause slope retreat and rockfalls that widen the canyon. The road was narrow and winding, and was flooded constantly; the streambed and the road were one and the same. I have no doubt that cars and people were constantly trapped and carried away before the new highway was built. Today, the narrows is a pleasant scenic stroll. The Fremont People were the first inhabitants of the region, and their petroglyphs are a constant reminder of their former presence. At Capitol Gorge, a badly vandalized panel still preserves some of the hallucinogenic figures. The urge to write on stone did not end with the rise of modern civilization. The rocks of the gorge contain hundreds of inscriptions from travelers from the 1880's to the present day (unfortunate, in the latter case). Some of the carvings are on apparently inaccessible cliffs; I wonder if it was worth it to hang from a rope to leave a sign of your existence for future generations. Some people certainly thought so (I guess I am blogging, instead of carving). Zion National Park is a real Jurassic Park, a place where the scenery is dominated by a single formation, the Navajo Sandstone. Today's photographs include the Angels Landing ridge and a view from the upper part of the trail towards the Narrows of the Virgin River. 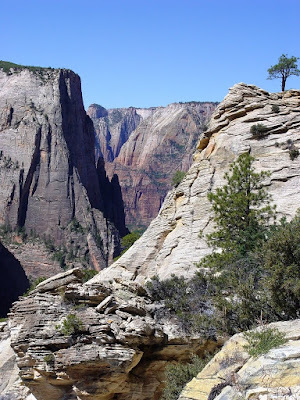 I consider the hike one of the most spectacular treks in the American west. The middle section of the trail is cut through a sheer cliff, and climbs through a narrow cleft called Refrigerator Canyon (for obvious reasons on a hot day). Then the fun parts: Walter's Wiggles, a series of tight steep switchbacks, and then a vertigo-inducing climb up the spine of Angel's Landing itself (top photo). The climber is assisted by a series of chains placed in particular steep sections. 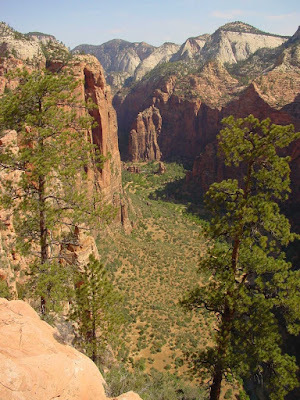 The payoff is a wonderful falcon-eye's view of Zion Canyon (peregrine falcons nest in the region). There is nothing quite like looking over a sheer 1,000 foot cliff. The sand dune environment is not conducive to the preservation of fossil bones, but dinosaurs did wander over the dunes, leaving behind numerous trackways. Here and there, fresh-water oases left behind deposits of limestone that contain a fossil record of crocodiles, small dinosaurs, and other smaller creatures. The sandstone of the Navajo is quite porous and the underlying Kayenta Formation is not. Water percolates through the sandstone, and when the Kayenta/Navajo contact zone is exposed, springs often flow. The much visited Weeping Rock, with its hanging gardens of ferns and flowers is one of these springs. 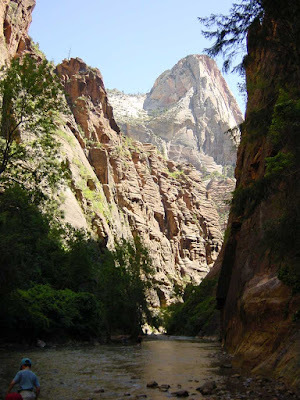 Zion National Park is one of the crown jewels of the national park system. Millions include it on a tour of Grand Canyon and Bryce Canyon (on their way to the air-conditioned casinos in Las Vegas). It is sometimes described as a Yosemite Valley without the granite and the glaciers, and the description is apt, but for a unique reason: like Yosemite, probably 90% of the visitors spend their time on the valley floor, and few take the time to explore the remainder of the park, including the spectacular Kolob Fingers section and the extensive backcountry. 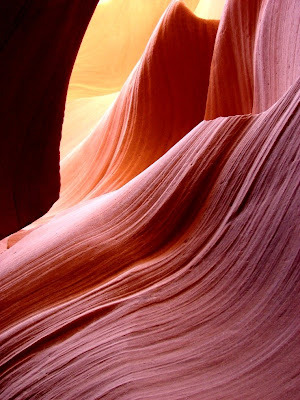 The park is the ultimate expression of scenery produced by the Navajo Sandstone. 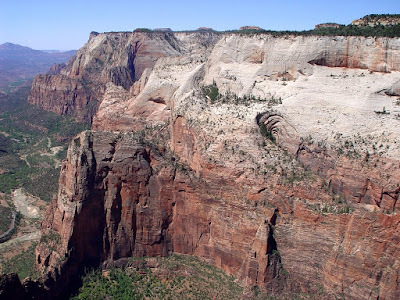 The canyon walls rise 3,000 feet or more above the valley floor, and 2,000 feet of that are cliffs of Navajo. The canyon was carved by the Virgin River, a tributary of the Colorado River. In the lower reaches, the canyon floor is relatively wide and flat (and thus the site of camps and lodges and other developments), but upstream beyond the end of the road, the canyon forms a series of narrow gorges a few yards wide, but thousands of feet deep (the Narrows of the Virgin River). The difference in the nature of the upper and lower canyon is striking, and is explained by the different ways that sedimentary rock is eroded. The cliff-forming Navajo Sandstone lies atop the Kayenta Formation, which is easily eroded and forms ledges and slopes. When the water carves through only Navajo, the canyon is narrow, but when the Kayenta is exposed, it erodes quickly and undercuts the cliffs of Navajo, which then collapse by way of mass-wasting and slope retreat. Rockfalls are a serious hazard in parts of the canyon. During my visits to the park (perhaps 25 times), I have seen two rockfalls, one of which filled the whole gorge with dust. What to do at Zion? If you have only a short time (shame! 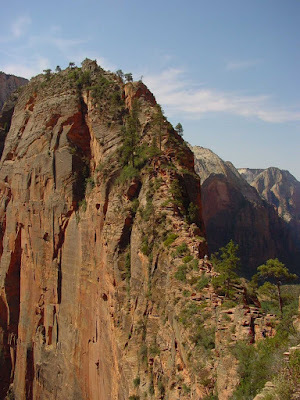 ), a hike up the Narrows (an easy stroll on a paved trail, and then a wet walk up the middle of the river), and a hike to Angels Landing (quite a bit harder, with 5 miles and a climb of 1,500 feet or so) should be a priority. With more time, get out to the Kolob Fingers, and take a longer hike. Quite a few miles in is the Kolob Arch, which lays claim to being one of the largest arches in the world. A hike to Observation Point is incredible (see the top two pictures), but also exhausting. What is your favorite secret at Zion? Following up on the previous post, I am adding a few close-ups of the Navajo Sandstone in Antelope Canyon near Page, Arizona. 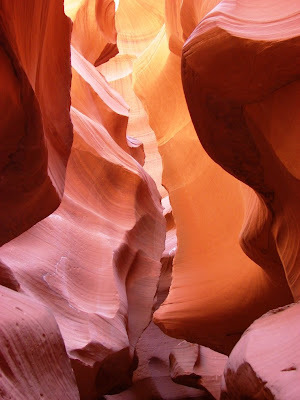 The beautiful slot canyon lies within the Navajo Nation, and is a tribal park. The upper canyon is known by the Navajo name Tse' bighanilini, which means "the place where water runs through rocks", while the lower canyon is referred to as Hasdestwazi, or "spiral rock arches." Crossbedding occurs in dunes as sand is carried up and over the crest and cascades down the lee slope (the "slipface"). The layers form with a distinct slope, at variance with the usual horizontal nature of sediments. The size of the sand grains varies with windspeed, and erosion brings out the those variations, as seen in the pictures above. The Real Jurassic Parks: Navajo! If the question arises as to what formation is responsible for the most dramatic scenery in all the Colorado Plateau, the Navajo Sandstone would have to be near the top of everyone's list (anyone out there have opposing arguments?). It is hard to imagine a rock unit that can erode into more beautiful colors, forms and structures (and I am being totally scientifically objective here....). 200 million years ago, a vast desert had spread across what is now Colorado, Arizona, Utah and Nevada and north into Wyoming. The idea that sand dunes represent a typical desert is a widespread misconception (typical American deserts are no more than 5% sand dunes), but in this case it was true: huge dunes crept across the landscape, in places burying the underlying rocks to a depth of 2,000 feet or more. The source of the sand? 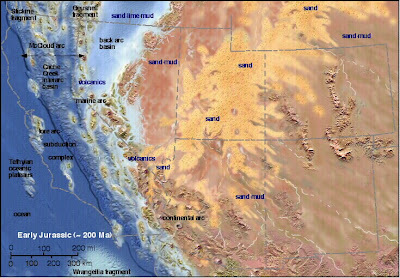 Early assumptions said the last remnants of the Ancestral Rockies, but some recent work suggests that the sand was derived from vast river systems with headwaters in the Appalachian-Caledonian mountain system. The uniqueness of the Navajo lies in the structure of the rock itself, the crossbedding, and the somewhat unique range of color: in different parks the rock is white, orange, red, yellow and vermilion. 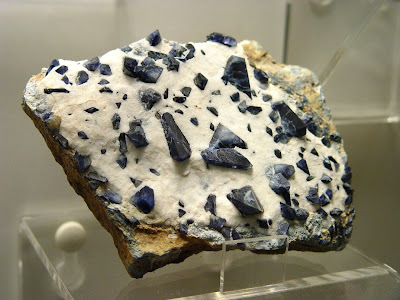 The variations are apparently due to a bleaching effect of once-present hydrocarbons that dissolved, and then reprecipitated, iron oxides in structures like domes and thrust faults. The iron oxide minerals hematite, goethite and limonite provide the intense color, and in places have formed the unique "moqui marbles", spherical concretions of hematite that are popular with rockhounds. Over hundreds of thousands of years rushing waters have ripped away at the sandstone, but because the well-cemented nature of the rock, mass wasting is ineffective at widening the gorge. Beneath the surface is a fascinating labrinth of twisting passages and curving walls. The canyon is both a challenge and a Mecca for photographers. The play of reflected light ranges across the brightness spectrum, and at the right times the rock seems to glow internally. 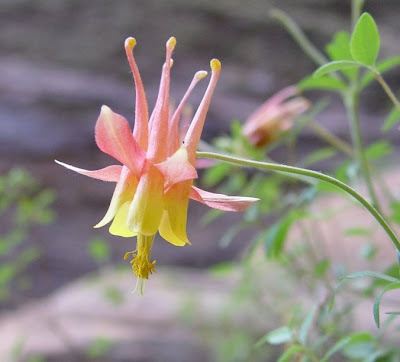 Today we make a return to our series on the geologic story of the Colorado Plateau. 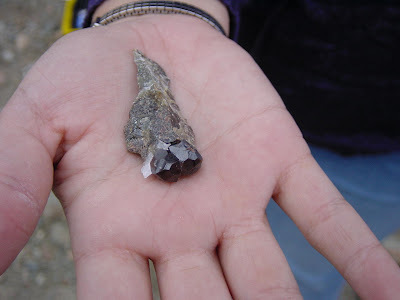 The Mesozoic Era left a stunning variety of rocks across the region. 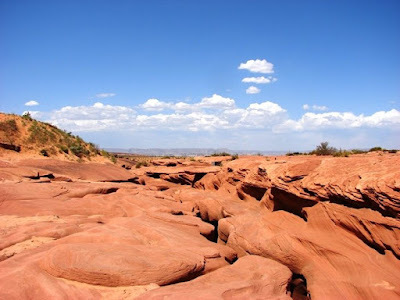 The Triassic story, with the Moenkopi and Chinle formations has been told, but today we explore a few of the real Jurassic Parks, the ones in which the scenery is formed by rocks laid down during the Jurassic Period. 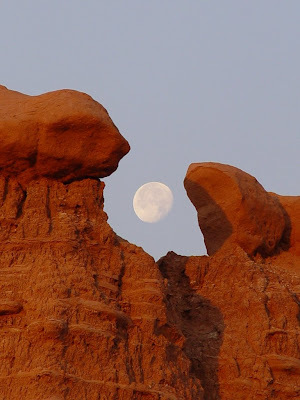 The scenery makers today are the Wingate Sandstone and the Kayenta Formation, which can be seen especially well in three parks: Capitol Reef National Park, Colorado National Monument, and Vermilion Cliffs National Monument. The Wingate appears in a prior post involving Canyonlands National Park. I notice that Geology Happens is a fan of the Wingate as well. The Wingate Sandstone formed in early Jurassic time as sand dunes migrated across the increasingly arid region. The layer tends to be bright orange-red, and has the crossbedded structure typical of rocks formed from dunes. Dune environments are not generally conducive to the preservation of fossil material, but reptile trackways are occasionally discovered. The Kayenta Formation lies above the Wingate and is most often exposed as a series of colorful ledges and slopes. It formed as a series of rivers flowed across the dune fields from the Wingate deserts. It contains numerous trackways of dinosaurs and other reptiles. Fairly easy to erode, it is not well-known as a scenery-former but it plays a critical part in the dramatic scenery at Zion National Park (to be covered in a near-future post). Colorado National Monument lies just south of Grand Junction and Fruita, Colorado (the top picture, and this one from a previous post). It is one of our lesser-known parks, but is well worth a visit if you travel through the region. The park preserves a spectacular eroded monocline, which is a folded sequence of rocks where the layers are horizontal at either side of the flexure, much like a rug thrown over a stairstep. 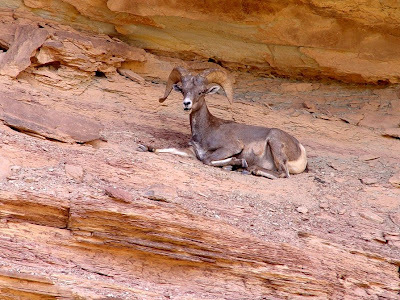 A marvelous paved road snakes in and out of canyons, mostly within the Kayenta Formation just above the Wingate cliffs. And the Wingate cliffs are incredible, a sheer drop just a few steps beyond the edge of the road. Although such roads are not being built in national parks today as a matter of preservation policy, I have to appreciate the effort that went into the construction of this one. There are many, many wonderful overlooks, a modest campground, and a decent visitor center. Lots of services are available in the nearby towns. Some very important dinosaur discoveries were made just outside the park (in younger formations), and signs point to the quarry sites. Capitol Reef National Park is illustrated in the second picture above, and in the uranium post a few days ago. 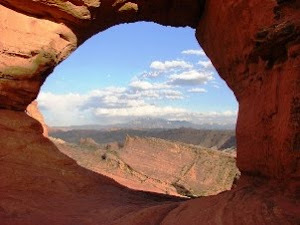 The park lies in the practically unhabited region of south-central Utah (Torrey and Hanksville are the main urban centers with a combined population of about 500). The park preserves another spectacular monocline, the Waterpocket Fold, that runs nearly 100 miles in a north-south direction. The "reef"of the park name refers to the difficulty settlers had in crossing the rugged eroded rocks of the monocline. Even today, a single paved highway crosses the structure, and a few unpaved gravel roads. A Mormon settlement (Fruita) was established here in the 1800's, and the fruit orchards are still maintained by the park service and volunteers. A favorite park activity is picking cherries and other fruits in season. The region was utilized in earlier times by the Fremont people, a lesser known culture than the Ancestral Puebloans of Mesa Verde and other areas to the south. Vermilion Cliffs National Monument is at the same time one of the more familiar and least-visited monuments in the United States. The interior of the park is rarely visited, and there are few facilities of any sort for tourists; a true wilderness park. On the other hand, hundreds of thousands, maybe millions of people drive past the park on Highway 89 from Jacob Lake to Lees Ferry and Navajo Bridge, where the Vermilion Cliffs cannot be missed or ignored. The sheer cliffs rise 3,000 feet above the highway, and are just beautiful. California Condors have been re-introduced into the region, and the lucky traveler might just catch a glimpse. Even with my more or less yearly visits to the region, I have never been in the monument, with one huge exception. Most of the park is a vast high plateau, but the northeast portion of the monument is dissected by an incredible gorge carved by the Paria River. The headwaters of the Paria lie to the north at Bryce Canyon National Park. 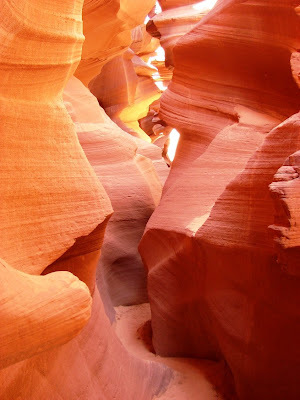 Where the river reaches the Navajo Sandstone, it has cut an extremely deep canyon, the Narrows, with a major tributary, Buckskin Gulch, which is one of the longest deepest slot canyons in all of the Colorado Plateau. I was in the Boy Scouts, and one of the last trips I took as a scout was a six-day backpack down the Paria River to Lees Ferry. It was one of the greatest adventures of my life, and probably had a lot to do with my eventual choice to become a geologist. Just the same, I knew little of geology at the time, and I would dearly love to repeat the adventure one day. I will search for my pictures of the event, but I had a camera I had no idea how to use, so the pictures that came out at all were over- and under-exposed. Plus, I dropped the camera in quicksand, and it was never the same after that (i.e. it never worked again at all). Have you ever been in real quicksand? It's not very much like Hollywood quicksand, but it was an invigorating experience sinking to my knees most unexpectedly. I had walked across about 50 feet of it before actually breaking through, and it was lots of fun getting back out!